Congratulations – you’re the proud new owner of a used car! You’ve settled the bill, traded in your old ride, and you’re ready to get behind the wheel. 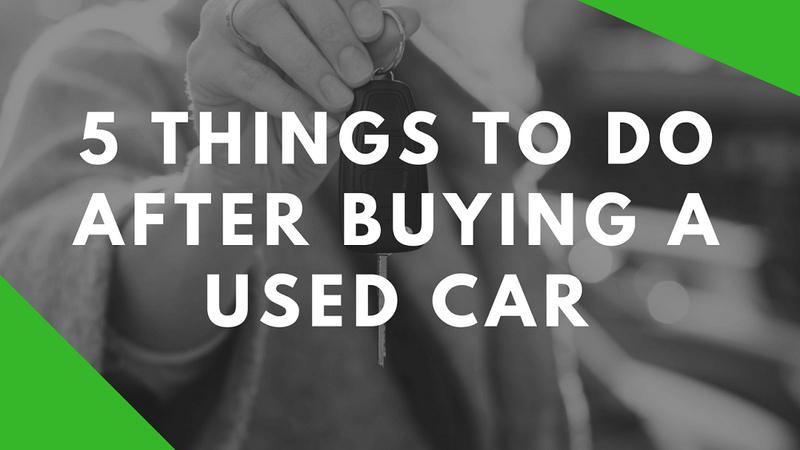 However, the work isn’t QUITE done yet – there are still some steps you should take after buying a used car to ensure you’re ready to hit the road. Check out these 5 steps to take AFTER buying a used car from Toyota of Clermont! Step #1: Take care of insurance. The first thing you should do before even getting behind the wheel is make sure that you either a) start a new insurance policy for your ride or 2) add your new ride to your existing policy. It’s illegal to drive without insurance, and it’s also a risk because if you get into an accident, you’re not covered. Toyota of Clermont recommends taking this first step as soon as you possibly can! You’ll also need proof of insurance to complete the rest of the steps. Step #2: Make sure the paperwork is completed – we’re talking title transfer and registration. If you bought your car at Toyota of Clermont, congrats! Our finance specialists have taken care of the necessary paperwork to make your life easier. However, if you bought your car in a private sale, you’ll need to do some legwork to complete all the paperwork. This includes visiting the DMV so you can get the title transferred into your name, as well as getting the car registered under your name. Don’t forget about the tags, too! Step #3: Skim the owner’s manual. A good way to get to know the car is to take a look at the owner’s manual. It’ll give you very important information regarding performance and maintenance! You’ll find out things like the recommended service schedule, what type of gas to use, how much to fill your tires, and which oil is best suited for your engine. It can also give you some insight as to performance and the abilities the car has. Take a look at it before you take the car out on the road! Step #4: Consider visiting a mechanic. It’s a good idea to visit a mechanic after a private sale (when you buy a used car from Toyota of Clermont, our mechanics have already given it a thorough safety and performance inspection). Schedule an appointment to bring the car in and have the tech take a look at it, bumper-to-bumper. They’ll be able to reassure you that it’s in good shape and that it doesn’t need any imminent repairs. Plus, they can get you on an auto service schedule NOW. Step #5: Get comfortable in the driver’s seat. Now it’s time to get behind the wheel – take the car out and hit the road. See how you like it, how it handles, if you’re comfortable inside the cabin, and if you need to make any adjustments or upgrades when it comes to parts and accessories! Shop ALL of our reliable used cars at Toyota of Clermont! We’re open seven days a week at 16851 State Road 50, just off the Florida Turnpike.